The SMITE World Championship is the first of its kind in eSports, a MOBA tournament for a game that doesn't follow the standard DotA template for serious cash, instead of alternating for a third person view non-isometric non-top down arena battler. Up for grabs is over two million dollars in cash and renown as the first winner of what is probably going to be a major yearly event. If you're new to SMITE or coming over to see what the tournament is about, then don't worry. There is little explaining that needs to be done on how the entire process works. First, let's talk about the tournament structure, then the prize pool, and finally the in-game effects of the tournament. The SMITE World Championship started in SMITE Pro League and the SMITE Challenger Cup, where various teams battle it out to see who will be part of the regional playoffs. The bottom two teams from the Pro League and the top two teams from the Challenger Cup face off in the Wildcard tournament. The top 2 from the Wildcard Tournaments, along with the top four from the Pro League compete in the regionals. The top two from each regional (those who make it to the finals) will advance to the World Championship. This applies to Europe and North America. 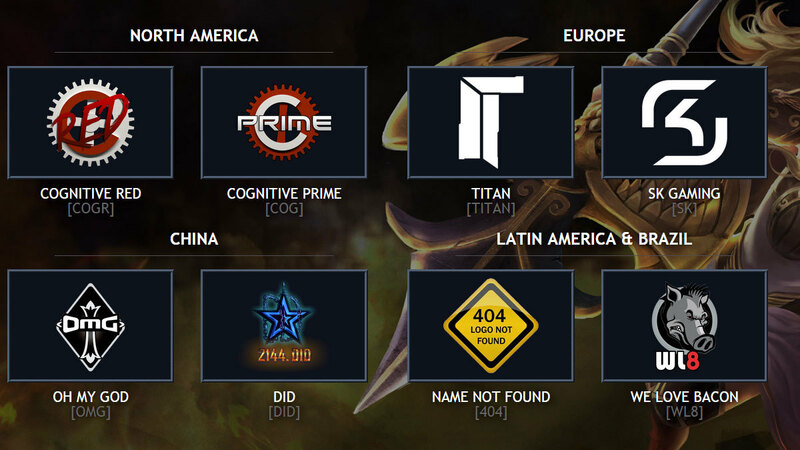 For China (2 teams) and Latin America (1 team) / Brazil (1 team), regionals were held in these regions and the teams were choosen from those tournaments. The eight teams will battle it out over three days in Atlanta, Georgia to see who takes home the grand prize - over a million dollars, with over 2 million American green sitting there for the taking. Friday will be placement day, where the teams will battle it out to see who will fight who in the knockout round. In the knockout round, the pro league players will fight the winning Wildcards and then they advance to fight the winners from the placement matches. Then finally, those who remain on Sunday will duel it off in the finals, while the lowers in the semi-finals will fight for placement for the awesome prizes up for grabs (you know that whole over 2.5 million they're going to make it rain on the players). Speaking for battling it out, do you have a best guess at who is going to win? Check out eSportsPools.com and enter to win real money in their contest to see who can choose the winner for the upcoming tournament. There is a lot of money up for grabs, over two and a half million to be exact. The prize pool is allocated from sponsorships, Hi-Rez, and through in-game contributions by purchasing items on the Odyssey. Every item purchased contributes to the prize pool and SMITE fans have been super enthusiastic about it. The biggest thing to note is this is the second largest pot in all of eSports - only the International with its 10 million dollar prize pool is in front. 2.5 million (so far) is nothing to sneeze at, and as of right now the winner will be walking away with a cool 1.2 million (which can still increase). As a note, if you like prizes, check out our SMITE giveaway - we're giving away some SMITE related goodies in celebration of the upcoming World Championship. If you can't make it out to Atlanta to see the tournament yourself live, you can still participate in the fun. First of all there is the Odyssey running until the 9th. Purchasing any item on the Odyssey grants you an Odyssey chest which contains a random skin, voicepack, or exclusive Odyssey item. The various items on the Odyssey are only available during the championship, so you have to buy them before the 9th and the bonus items available at various milestones are again - only available now. If you want any of the Odyssey items, BUY NOW! They're gone on the 9th, so a limited time remains for you to cash in on the exclusive championship items and this will probably be the last time you'll obtain any of the other Odyssey items easily, if any interest you. The other way you can join in the fun is to watch! Hi-Rez is selling a digital pass for $24.99 that includes the digital goodies plus subscriber only chat, the tournament itself will be streamed on Hi-Rez's Twitch Channel. Additionally, stay tuned to Ten Ton Hammer and eSportsMax as we continue to cover the upcoming SMITE tournament.